The types of injuries that occur in car accidents vary depending upon many factors, including the vehicles involved in the accident, the speed of the crash, the type of accident and whether the drivers involved were wearing seatbelts. Traumatic brain injury (TBI) – Vehicle collisions are one of the top causes of TBI, according to the Mayo Clinic. Brain injuries can range from a concussion, to a coma, to permanent brain damage resulting from trauma. Even less severe cases of TBI can cause symptoms such as fatigue, confusion, mood changes and cognitive or memory impairment. Spinal cord injuries –More than 40 percent of new spinal cord injuries each year result from car accidents, the Mayo Clinic reports. Spinal cord injuries can cause complete paralysis below the area where the injury occurs, resulting in an inability to move or to experience sensations. Types of paralysis include paraplegia (loss of use of the legs) and quadriplegia (loss of use of all limbs). Whiplash – Whiplash is a specific type of neck injury that is very common in car accidents, especially rear-end collisions. Whiplash can persist and cause chronic pain and impaired motion for months or years. It results from the neck being violently thrown forward and then backward in a whip-like motion. Burns – There were approximately 219,000 vehicle fires in 2011, according to the National Fire Protection Association. These fires caused an estimated 200 deaths and another 1,190 injuries. Bone fractures – The most common broken bones after a car accident include broken ribs (which can puncture the lungs) and broken bones in the face. Broken arms, legs, necks, backs, hands, feet – and virtually any other broken bone – can also result from car accidents. Back injuries – A back injury can result from damage to the bones in the back (vertebrae). It can also result from damage to the soft tissues in the back, including the muscles, tendons and ligaments. Fractured vertebrae, lumbar strains or sprains, herniated discs and bulging discs are back injuries that often occur in auto accidents. Amputation – An amputation may occur in a car accident if a victim is thrown from the vehicle or as a result of a limb being crushed or severed in the accident. Amputation can be one of the most expensive injuries to treat. Internal injuries – Both organ damage and internal bleeding can occur as a result of a car accident. Internal injuries are often dangerous or even deadly, in part because people may be initially unaware that they have been injured. A victim might go home after a crash, only to experience a serious medical emergency as a result of internal bleeding. Air bag injuries – Although they are life-saving devices, an air bag inflates at very high speed. This can cause broken bones, bruises and lacerations in the face, wrists, hands, arms and chest. An air bag can also cause much more serious injuries if it malfunctions. The driver responsible for causing an accident could be held responsible for compensating victims for all of their expenses, including lost wages, medical bills and property damage, as well as compensation for pain and suffering and emotional distress. 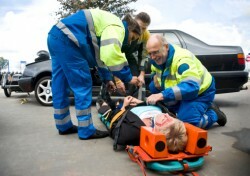 It is very important to seek medical attention for your car accident injuries right away. You should always go to the doctor to get checked out after an accident, even if you aren’t sure that you suffered any health consequences. Your doctor can help to explain how your injuries happened as well as how serious they are. If you are in pain because of your injuries, it is also a good idea to document this so you can make clear how much you suffered when it comes time for a settlement or a jury to award monetary compensation. Keeping a journal about how your injuries affected your daily life can be helpful if you need to describe your impairments later. It is very important that you take the right steps after a car accident so you can be fully and fairly compensated for all of your injuries. An experienced Atlanta car accident injury lawyer at Parsons & Associates, P.C., can help you protect your legal right to compensation. Call us now at 770-422-9000, or fill out our online contact form, for a free and confidential claim review.